The Cell Properties panel is displayed when the cursor is placed inside a table cell or when the <TD> tag is selected in the Tag Selector. In the Element ID text box (displayed in Simple view) enter the value for the id attribute. It will uniquely identify the element (table cell) in page. In the Width text box (displayed in Simple view) specify the width of the table cell where the cursor is placed (it will become the width of that respective table column). The width can be given in either number of pixels or percentage of the whole table's width. 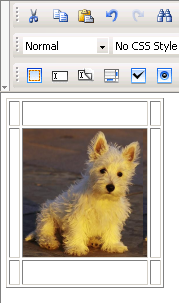 If you enter the width in pixels and the value is greater than 1000, a pop-up window will display an error message: "The value must be lower than 1000." It's recommended that you enter the value as percents. In the Height text box (displayed in Simple view) specify the height of the table cell where the cursor is placed (it will become the height of that respective table row). The height can be given in either number of pixels or percentage of the whole table's height. If you enter the height in pixels and the value is greater than 1000, a pop-up window will display an error message: "The value must be lower than 1000." It's recommended that you enter the value as percents. Usually though, the height is not set because it increases anyway as you type text in the table cell. Check the No Wrap option (displayed in Simple view) if you want the text inserted in the current cell to be displayed as a single line (if there are more paragraphs, each of them on a line). This could enlarge the cell. If the option is not checked, then the entered text passes on to the next line when it reaches the cell width limit. 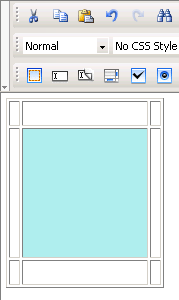 If the Header option (displayed in Simple view) is checked, the content from the current cell will be formatted as bold and centered (header style). By clicking the Advanced button (displayed in Simple view), the Cell Properties panel will switch to Advanced view. You will be offered the possibility of setting advanced options for the currently selected table cell. 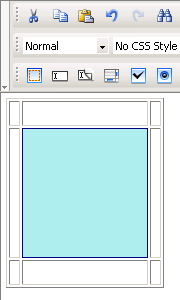 With the Bg text box (displayed in Advanced view) you can set the desired background image for the selected cell (where the cursor is placed). You can either enter the full path (URL) to the image previously uploaded on the remote server or you can click the Browse for Image button to select an image from the server. Note: It is your task to make sure the table cell and the image have the right dimensions, as automatic resizing of the image to the cell's dimensions will not take place. By clicking the Simple button (displayed in Advanced view), the Cell Properties panel will switch to Simple view. You will be offered the possibility of setting various options for the currently selected table cell.